Cats Protection is one step closer to changing the law on air gun ownership in England and Wales, in the hope that we can prevent future cruel attacks on cats like Stephanie. 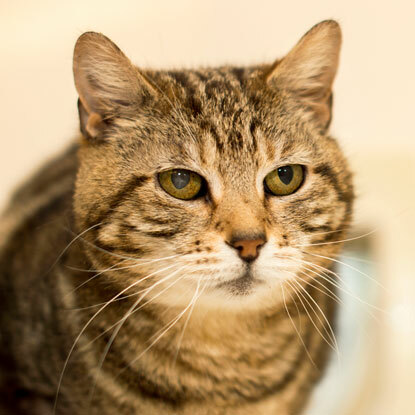 This lovely five-year-old moggy arrived at Cats Protection’s Bridgend Adoption Centre because her owner was going into care and couldn’t take her with her. The staff at the centre soon noticed that she was very sensitive when being stroked down her back and so took her for an X-ray to check for any injury. When the scans came back, they were shocked to discover an air gun pellet lodged in her leg. As the pellet is not thought to be the cause of her current discomfort, the vets decided to leave it alone, but the initial shot would surely have caused her a great deal of distress at the time. Stephanie has now found a loving new home but she’s unlikely to be the last cat we see with such a cruel injury. In 2017, 164 cats in the UK were reported in the press as being shot with an air gun. A 2016 Cats Protection survey also found that almost half of vets questioned had treated cats which had been the victim of attacks by air-powered weapons in the last year, with nearly half of these shootings proving fatal. Cats Protection’s Head of Advocacy & Government Relations Jacqui Cuff said: “Cats who are shot with air guns can suffer horrific and often fatal injuries. We have heard stories of cats losing eyes, limbs and being left with life-changing injuries as a result of such attacks. Often owners are unaware of why their cat is injured until a veterinary x-ray shows air gun pellets embedded into their flesh. “We know that 90% of reported air gun attacks on cats happen in England and Wales, and it’s no coincidence that these are the parts of the country where licensing of air guns is not in place. Laws on air guns in Scotland and Northern Ireland are much tighter, and we believe this should apply for the whole of the UK. 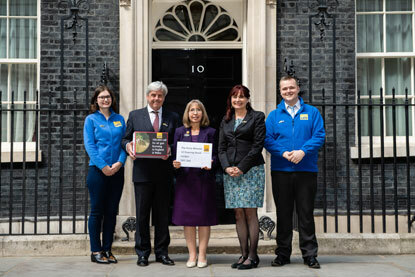 Cats Protection’s Chairman, Linda Upson delivered the petition to Downing Street with Dominic Sullivan, acting Chief Executive and the charity’s Advocacy team. In May, Cats Protection delivered a 100,000-signatiure petition directly to 10 Downing Street to call for a change in the law on air gun ownership in England and Wales and along with over 50,000 supporters, the charity has also written to the Home Office calling for air gun licensing as part of a government review.